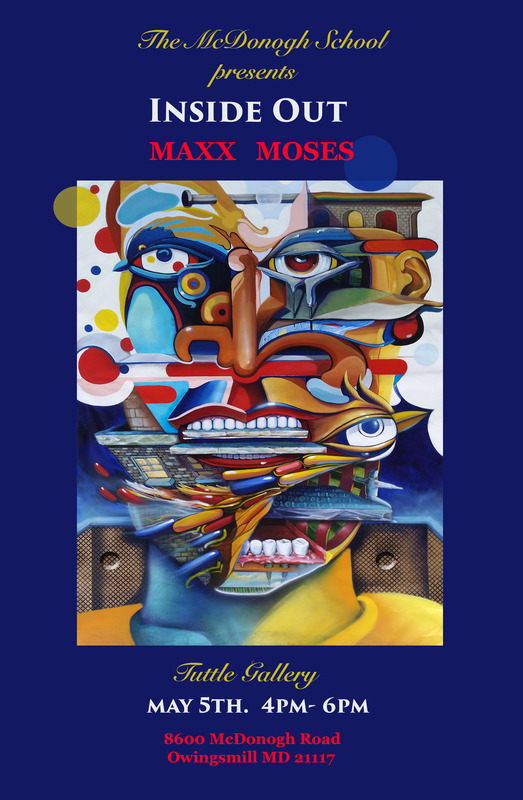 “INSIDE OUT” is the latest eclectic exhibition of Mr. MAXX MOSES most recent work accompanied by a photographic retrospective of his murals from around the world juxtaposed on metal, tile and funky canvas giclees. This is a unique event. 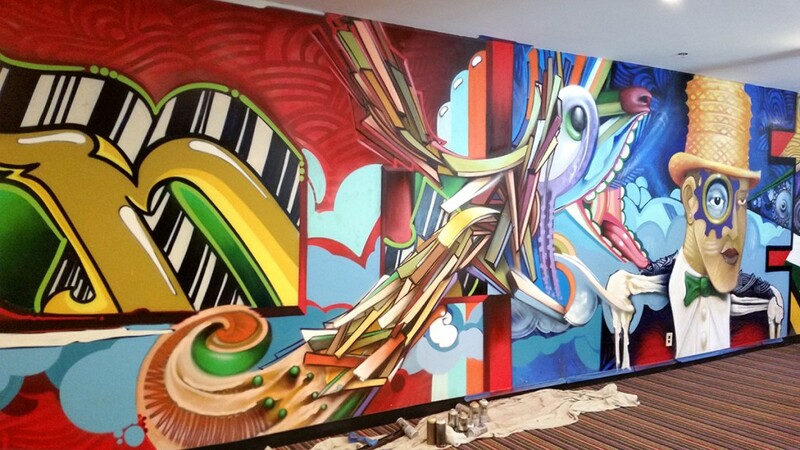 MAXX MOSES is a master Spray Can Artist and international muralist. This show will highlight his unique imagery from his long career of painting and will encapsulate an exciting look at many of the great work he has created throughout the world. 2016 marks 40 years of painting for MAXX and he has decided to present this show as a fun Pop up Shop which will, we have no doubt, push the boundaries of our media drenched brains through the doors of timeless imagination. There is a great story behind Pose 2, aka MAXX MOSES. 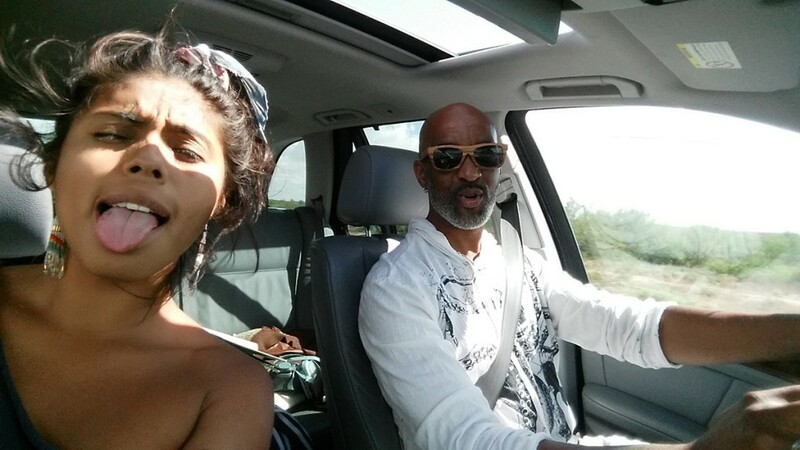 He is a true non-conformist, a student of metaphysics, a dreamer, and a man of many alter egos. 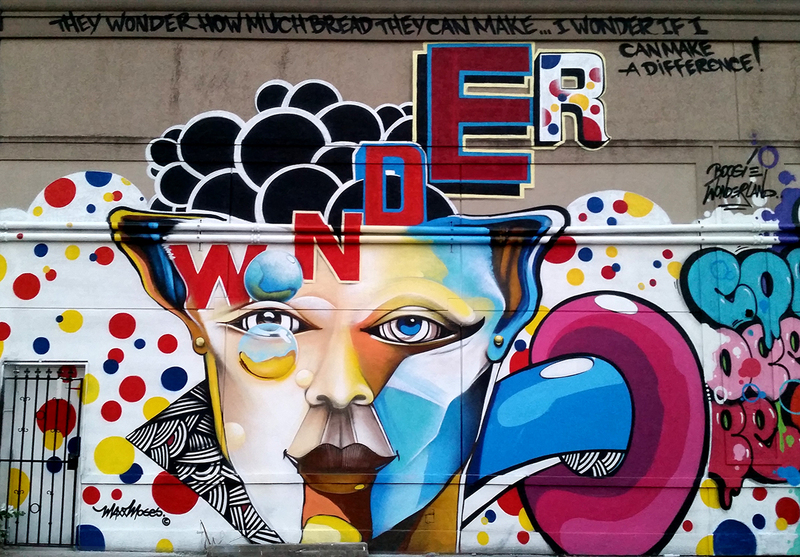 He emerged from the era of painting his name on subway trains in NYC and carried that youthful exuberance into his education at SUNY Brockport College where he fused “subway art” with surrealism, creating his own form of artistic identities. 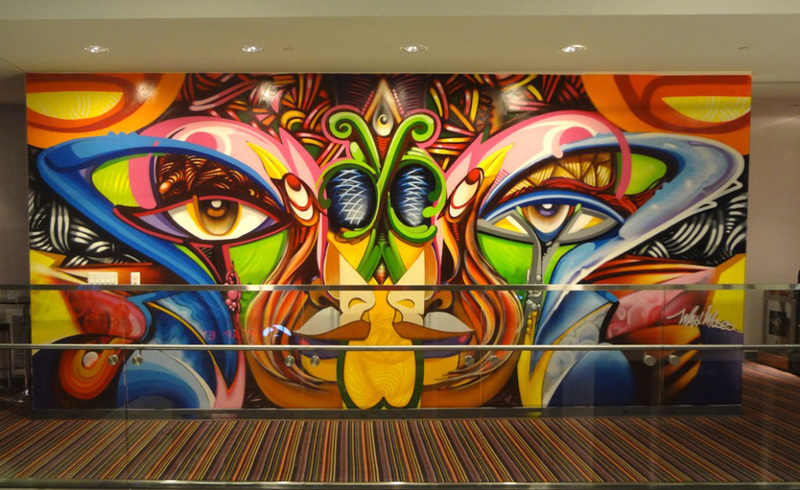 MAXX has been commissioned to create many large-scale spray-painted murals across the globe. 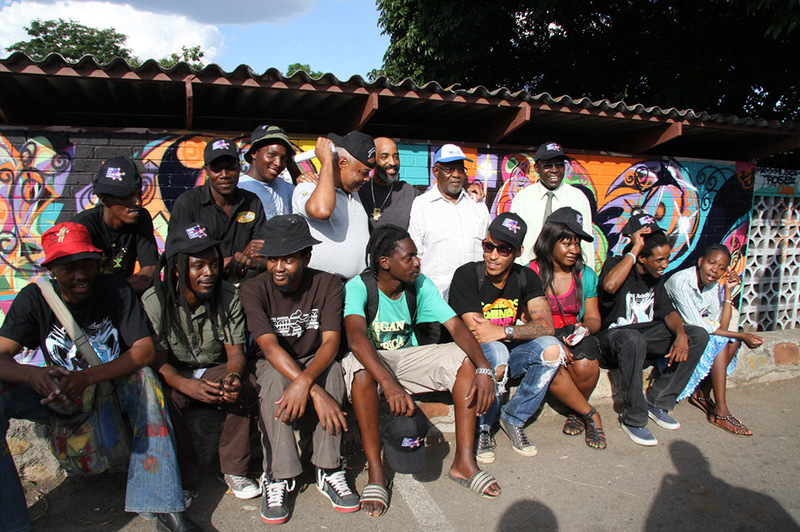 Through these painting experiences he has forged deep connections with many communities. It is through these connections that he continues to examine the depth of his learning and the quality of his art. 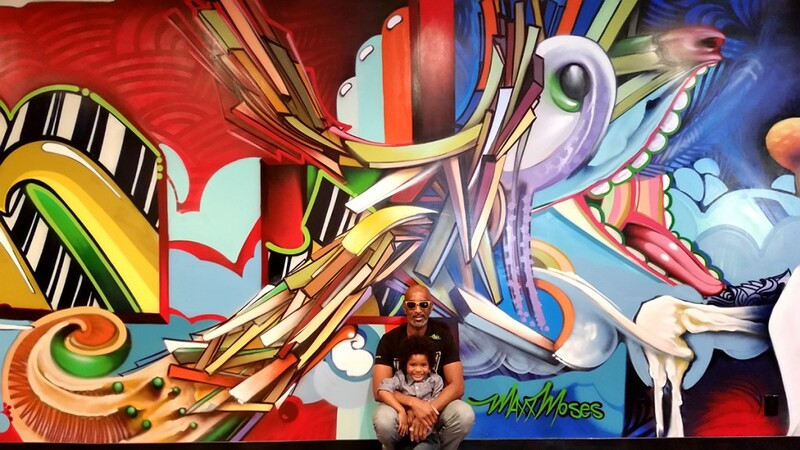 His international travels have also taken him to Sao Paulo, Brazil where he was invited to the 3rd Bi-annual International Graffiti Fine Art Exhibition. Considered a VIP, the Brazilian consulate made special last minute arrangements to ensure MAXX MOSES was in attendance. Other notable events include a month long residency at the “Art Hub” in Abu Dhabi which resulted in the creation of a 480 sqft. work called “Gold Digger” which is now on display at NYU in Abu Dhabi. 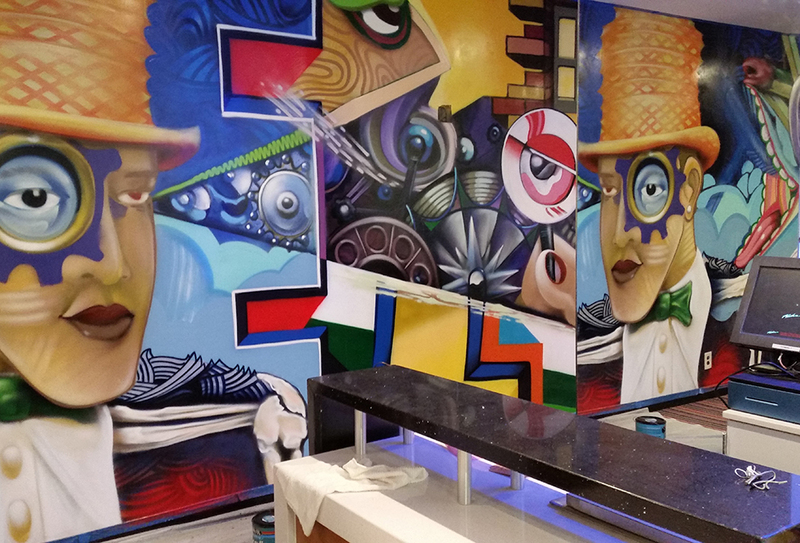 He has also worked with many innovative non-profits, such as “Cross Arts”, in Tripoli, Lebanon where he inspired the youth and shared the wealth of his experiences through mural workshops and live painting. 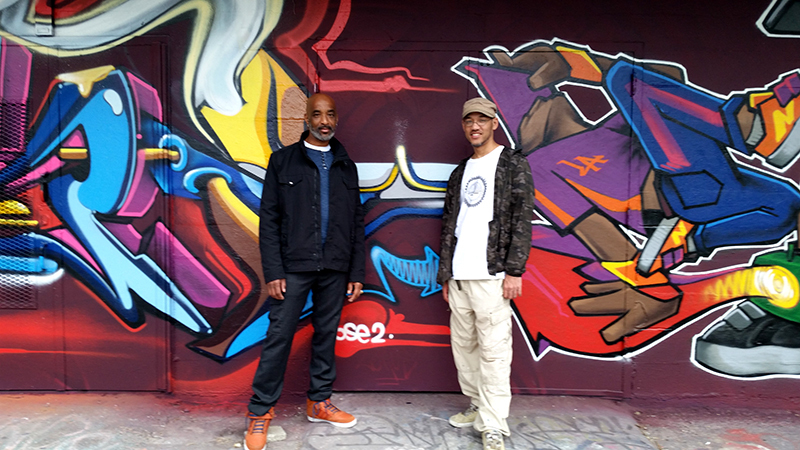 In the U.S two major murals stand tall in Washington DC, “One-Sip” and “Love Boat” were created in collaboration with Words, Beats & Life; a non-profit organization where MAXX serves as a mentor for mural apprentices and as a powerful lecturer. His last solo exhibition, ” Good Morning America” was a radical departure from his dreamlike landscapes. It was a very personal and vivid examination into how racism and false doctrine had affected his own mental well being. The most profound and disturbing work of the exhibition was a self portrait entitled “The Minstrel Cycle”. 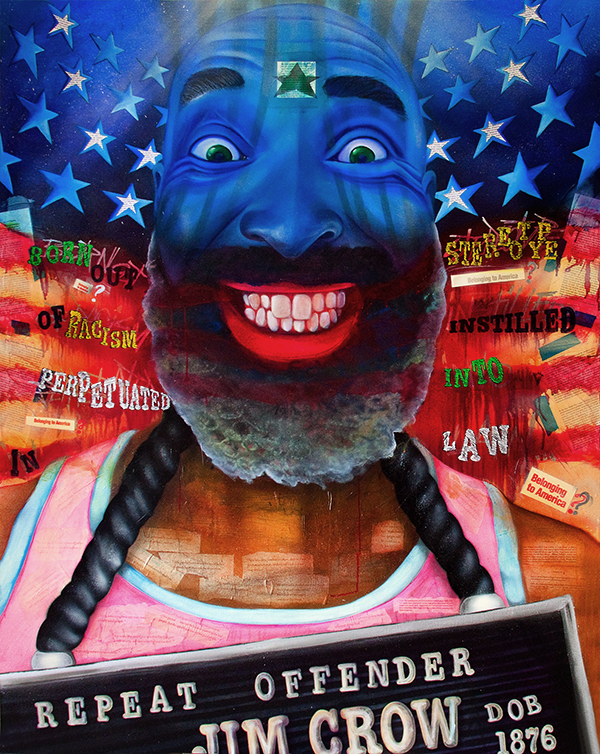 This highly acclaimed piece of art was also shown at the “Manifest Justice” exhibition in LA and is now part of the private collection of the National Endowment of the Arts. 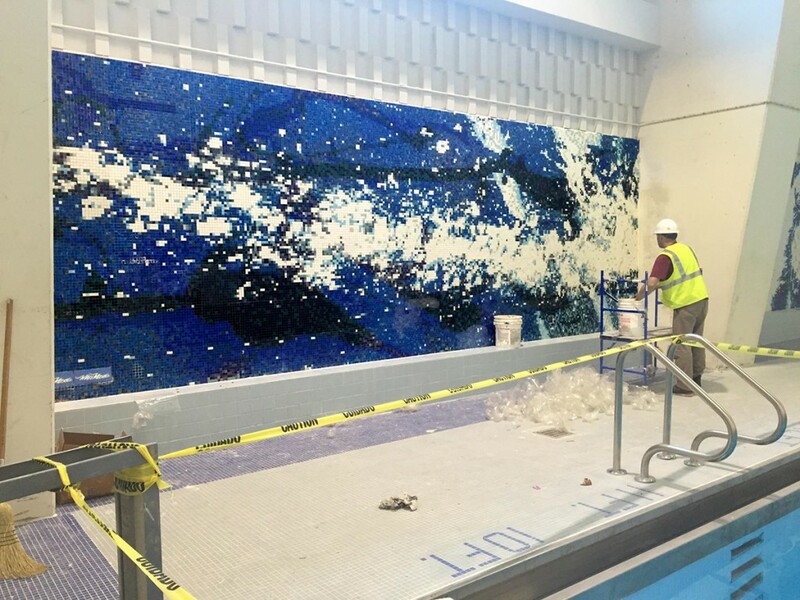 *A three- day mural collaboration between the students of McDonogh School and the artist. 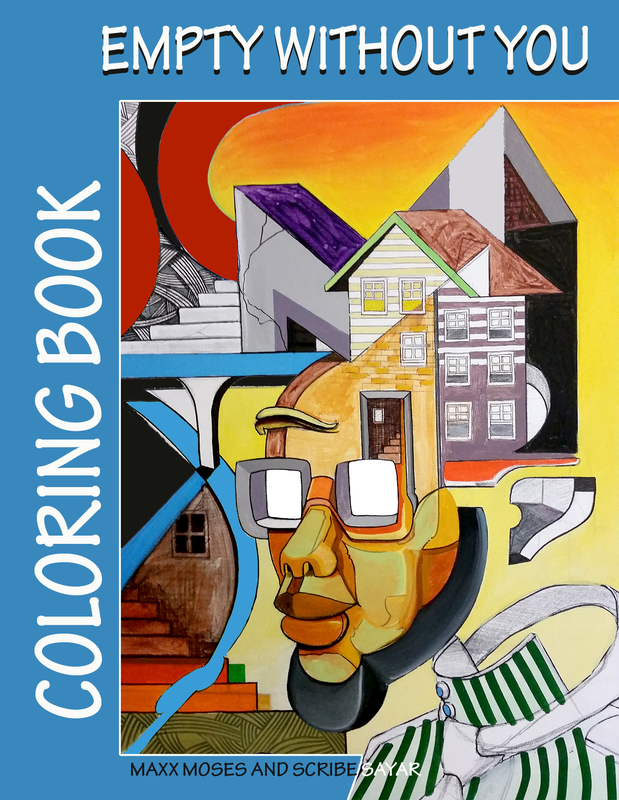 *Book signing and release of the long awaited coloring book “Empty Without You”…a joint venture between MAXX MOSES and Scribe Sayar. This book was birthed from a 2012 music video directed by MAXX and featuring rhyme spitting vocalist Scribe. Captivating as that sounds, the book is even more fascinating in person with an imaginative layout of iconic drawings coupled with the poetic lyrics of Scribe that on opposing pages appear to be having a conversation with each other. Signed copies will be available at the show. 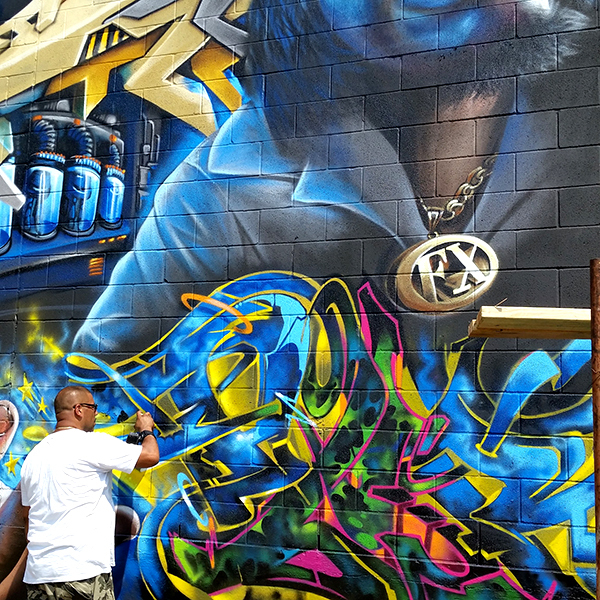 In 2012 the legendary Philadelphia, Graffiti Writer and good friend of mine Razz 1, transitioned to the afterlife. 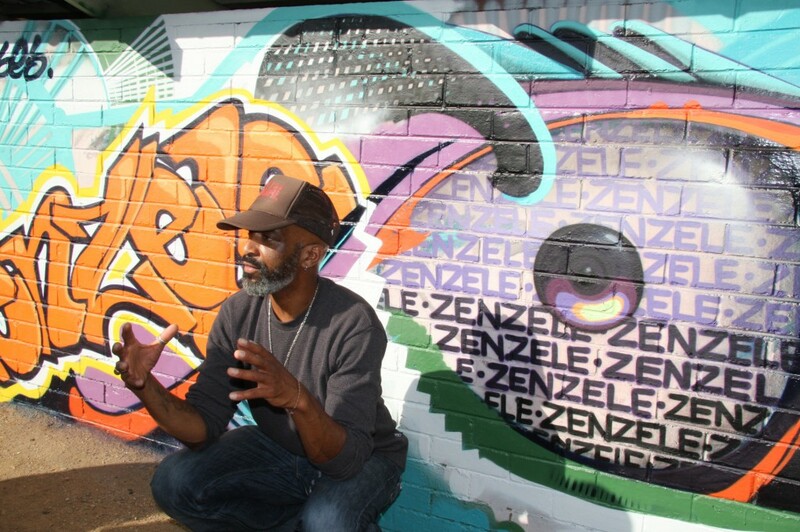 Razz’s presence in Philadelphia was prolific and Gigantic his simple readable but stylish Tag could be found in nearly every neighborhood throughout Philly. From the 70’s throughout the 90’s his name shined. But writing wasn’t his only claim to fame. 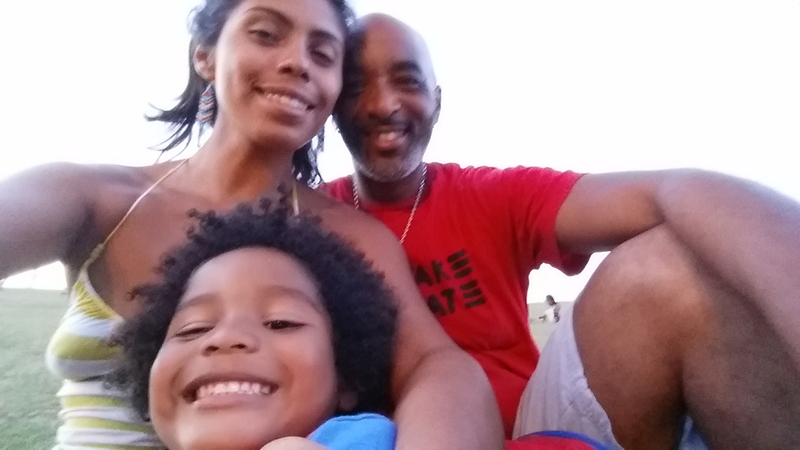 Razz aka Ahmed, was a father an entrepreneur and social activist. Right in the heart of Philadelphia on South Street he and his wife Nandi, Co-operated The Pearl Of Africa, where they sold all the greatest Afrocentric apparel and accessories. Equally important the Pearl Of Africa’s upstairs location was used for lectures where the most notable black scholars, metaphysicians and healers would come to enlighten and inspire the hearts and minds of Philadelphians. 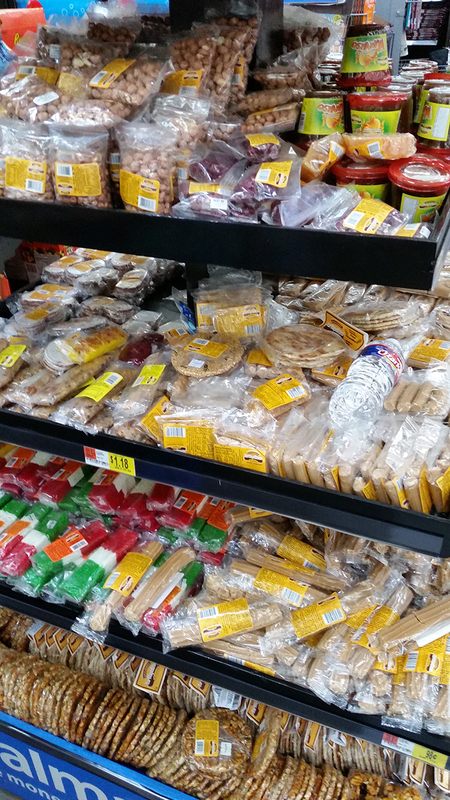 It was a ripe time in Philadelphia and Razz was a savvy businessman who seized the opportunity to provide for his family and feed his community seamlessly. His presence and store are greatly missed but his spirit and name, Lord Razz Law1, forever lives. Earlier this Mat Mathai, of Chemspace contacted me. Mat is a great collector of my art and many other Writers artworks throughout the country, including Razz, us three have been friends for years. 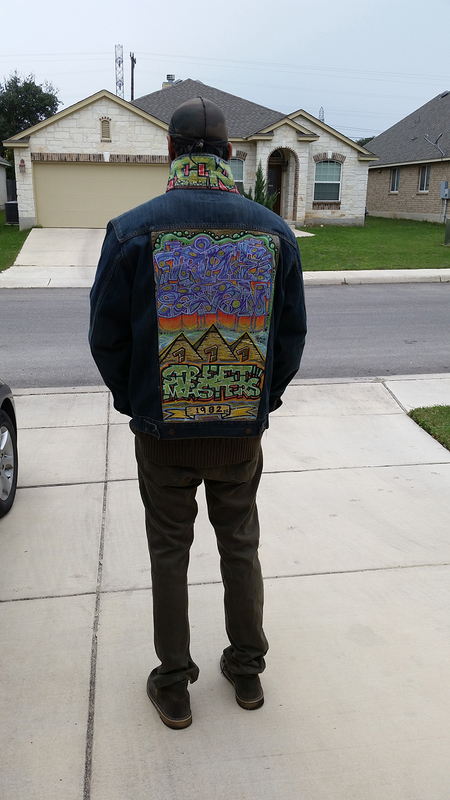 He said pose it been a long times since I’ve purchased one of your paintings and a lot has changed, like your new identity to Maxx Moses, and the transition of our dear friend. 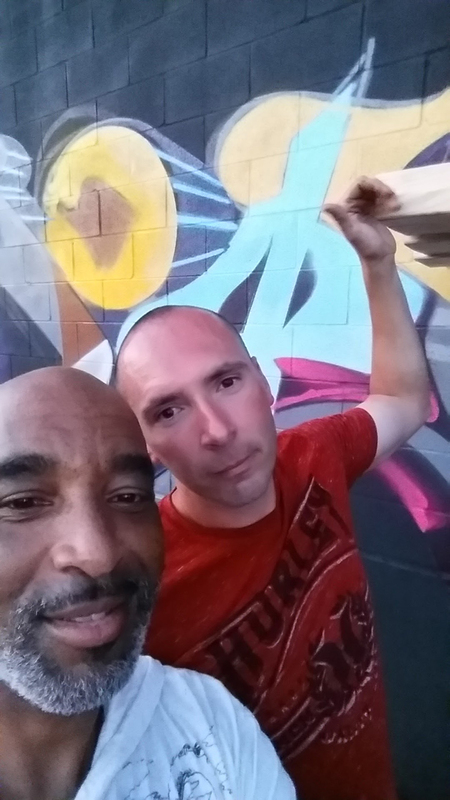 I mentioned to him Leon Rainbow and myself had just done a rest in peace for the lord Razz in South Philly only weeks ago in my old neighborhood and how his presence was fresh in my mind. Mat said Pose I like the direction your Art is moving in and I want to commission a new painting that reflects the energy of Pose 2 and the magic of Maxx Moses. However in the mist of this creation think of our dear friend Razz let his eternal presence shine through this painting brilliantly. While creating this piece I was wondering how and where to place Razz’s name within the painting and just couldn’t figure it out, so I just kept painting and as I was three quarters of the way complete with the painting I reached back to look at all the emails Mat and I exchanged. I found an image of one of Razz’s paintings Mat sent to me and decided to make mini versions of the painting. I printed and pasted them all along the sides of the entire canvas. 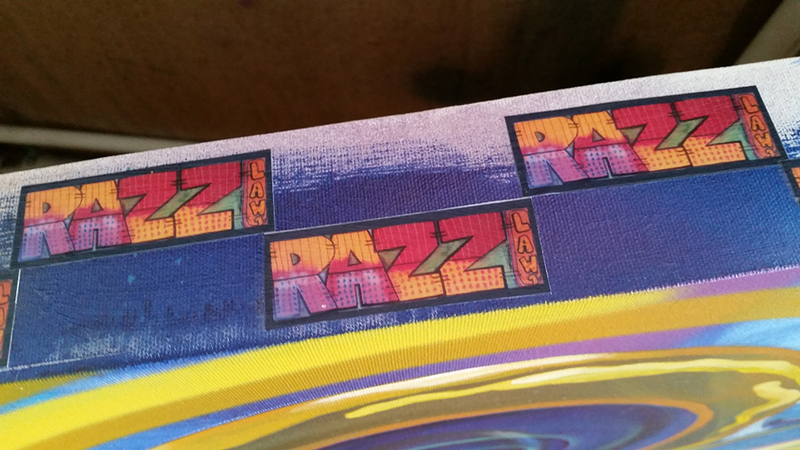 Yeah this felt right Razz was not just about how good his name looked but how often you seen it! 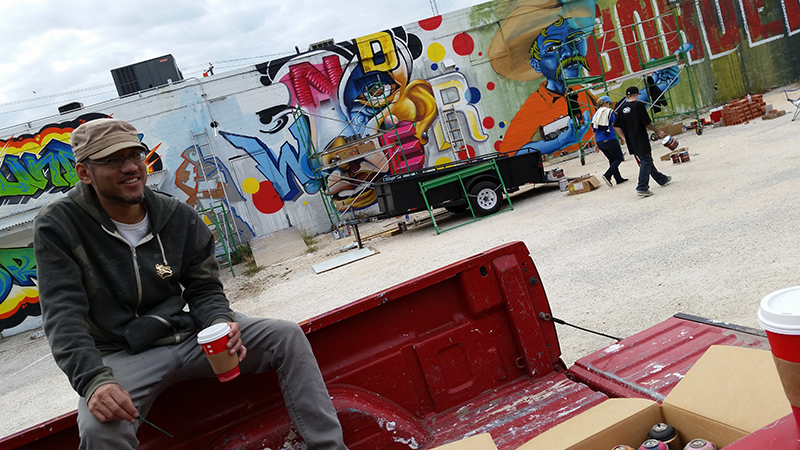 Last week I was invited to paint at Content Under Pressure, an Urban Art Festival in San Antonio TX. The new owner of The Paint Yard, my good friend Beatriz Rodriquez, hosted the event. 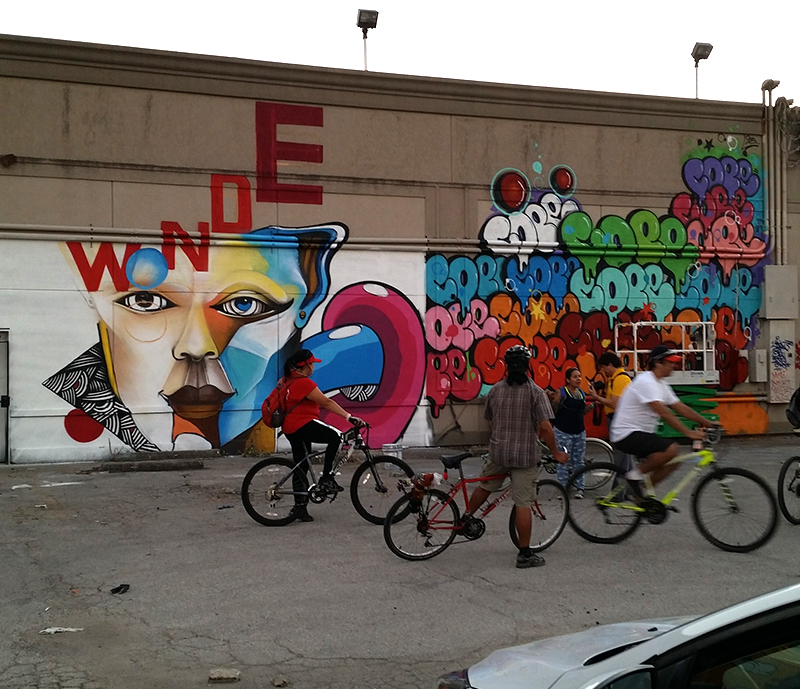 This year she took the liberty to expand the event into an urban art festival. Still using spray painting as the driving force of the event but also inviting many local artist who use paintbrushes as well. 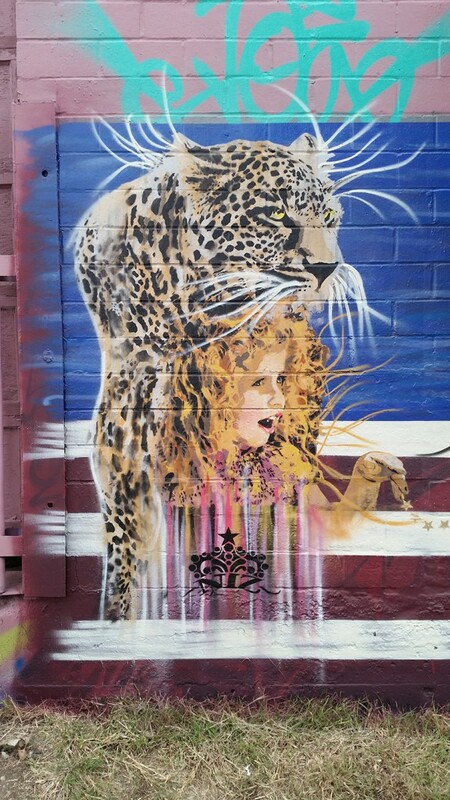 Personally it was a treat to collaborate with some really cool artist, Sano, originally from Cleveland Ohio and Real 3 from Monterrey Mexico. Those of you who know Sano recognize this Great Spirit, his creative flexibility and good nature as a warm welcome. 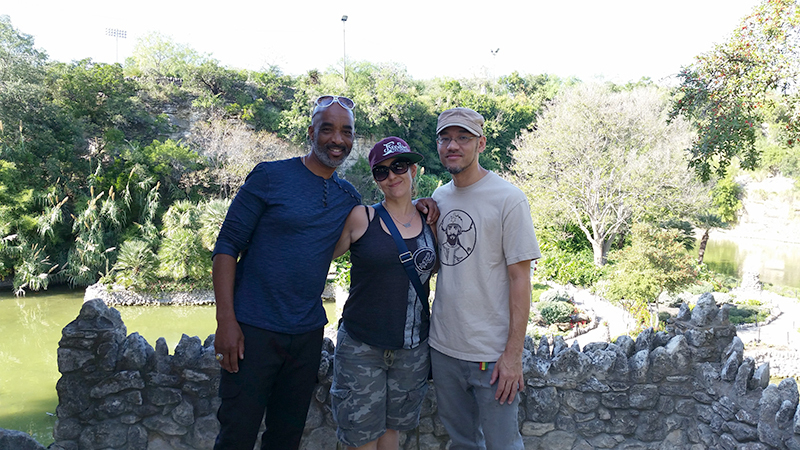 His wife, B-girl Emiko has always wanted us to collaborate and finally it happened. Real3 from Mexico had arrived before us and began painting his famous blue characters. He showed me his sketch and explained how he was going to use the word border very bold next to the character. 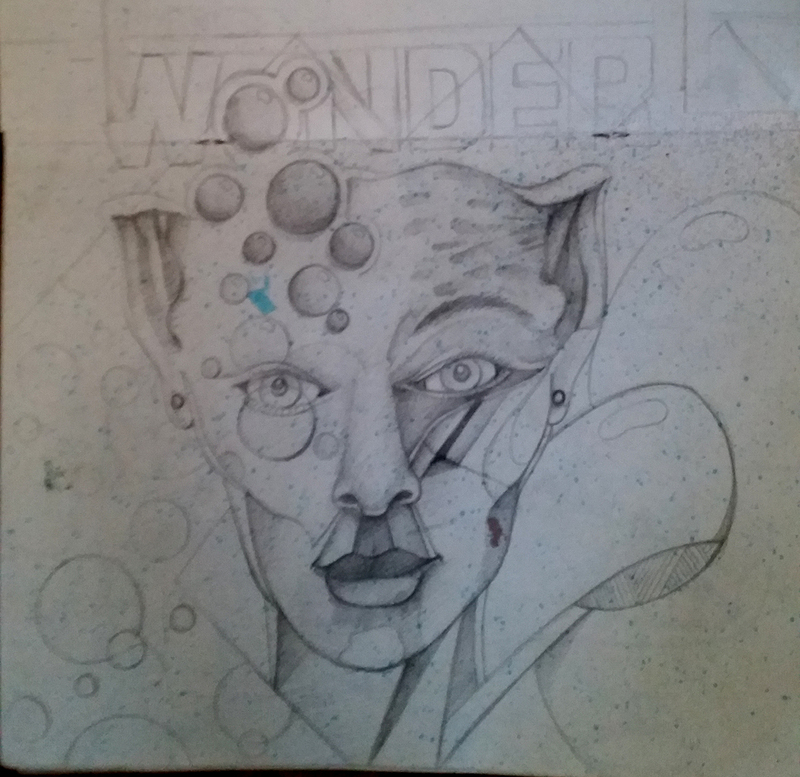 Excellent I knew somehow what I planned on painting (my wonder bread concept) would fuse together nicely with his concept. 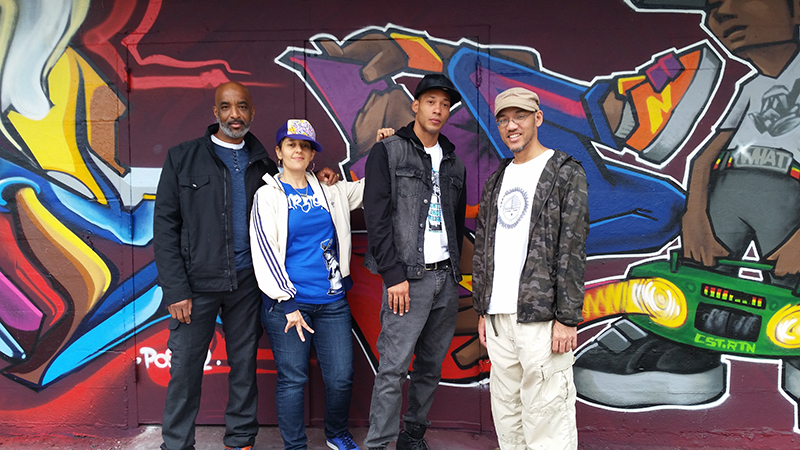 Overall the event was a huge success I got to spend time with my long time Urban Warriors crew mate Wizart, B-girl, Star Veronica and the deeply talented emcee Seven Seven Seven what a spectacular weekend. 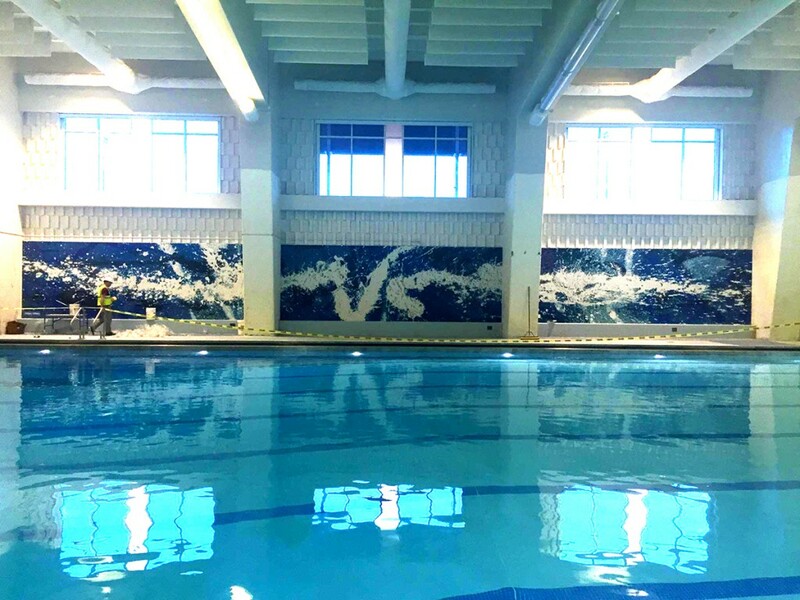 Last year I competed and won the design award for the Pool Mural installation within the new Roosevelt HS In Washington DC. All participates were asked to create and submit a scaled down version of 120ft. by 10ft. painting that would then be photographed and turned into mosaic tiles. 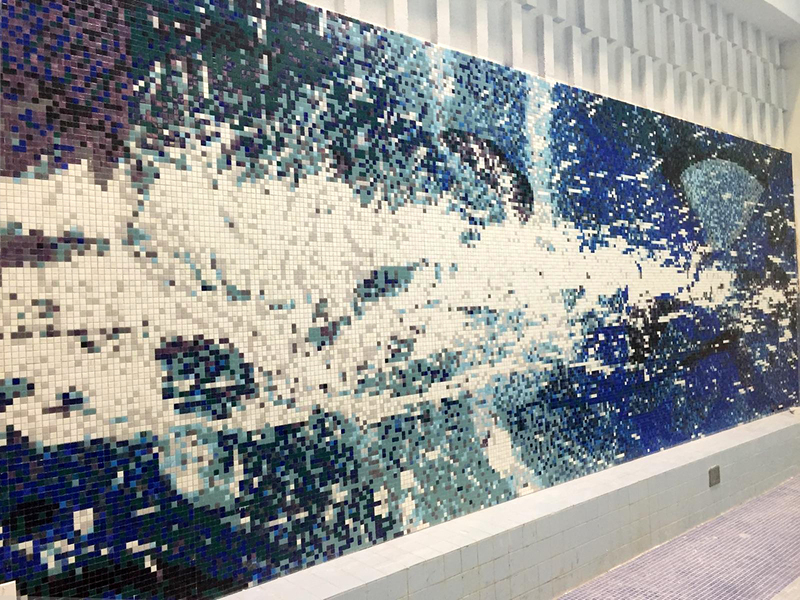 Immediately I began to think about my art, water and the mosaic tiles. 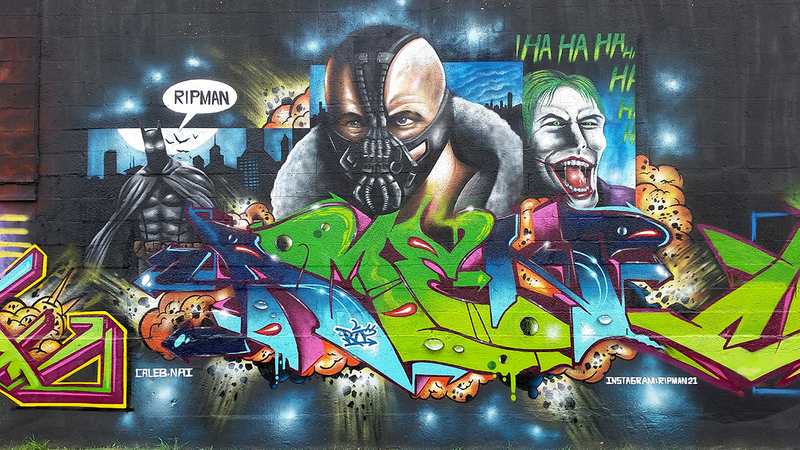 A few months earlier I’d just completed a bunch of” Urban Surrealism” murals packed with color imagery and characters. 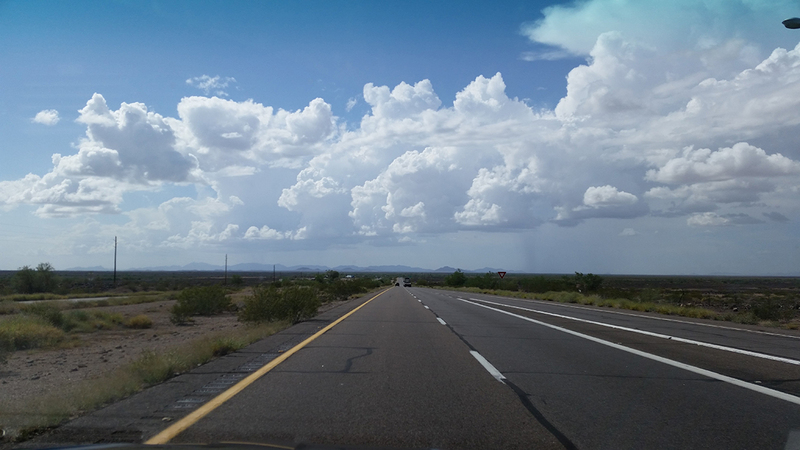 So for this project I wanted to move as far away form that approach as possible. I asked myself two questions. First what type of imagery would translate successfully onto tiles? And secondly what type of energy do I want to transmit visually? Personally I’ve always loved swimming and water and while thinking about this project I began to visualize myself sitting at the pool area listening to the sounds of splashing water and people cheering. The endless motion of the water and the sound of people in the water is what I realized I needed to capture within this painting “kinetic Swim”. I was determined to keep a minimal color selection but with strong contrasts. The coolest thing about this project was the selection process. I had to fly down to DC and present the painting. Upon arrival there we are a bunch of artist all sitting and waiting for their opportunity to present. I was totally surprised however when I walked into the room and there where a bunch of teenagers sitting there. I was like really you students are the panel? My whole vibe changed… I was like YO, lets do this! One of the few adults in the room was like yes Maxx the students are going to select which painting they want for their school. I was like cool so we don’t have to waste any time with formalities, because these young people are going to know exactly what they want… and they appreciated this reply. Relaxed and happy, I began to introduce myself while images from my past works flashed upon the digital screen. I scanned the room constantly to gain a sense of what these teenagers were thinking and feeling, and then I asked that the projector be turned off. It was time to unveil my painting “kinetic Swim along with my vision and thoughts about the project and how I wanted to convey the essence of energy over imagery. Instantly questions emerged that lead to really good conversations. These young students and I were so in tune with each other and to what was being presented I didn’t have to convince them of why they should chose “kinetic Swim” … they were already in the water! Upon leaving I shared with the students how glad I was to be in their presence and how most of the time this process is usually a situation for “adults only”. I remember how high I was leaving that room and perhaps knowing in my spirit the project was mine! 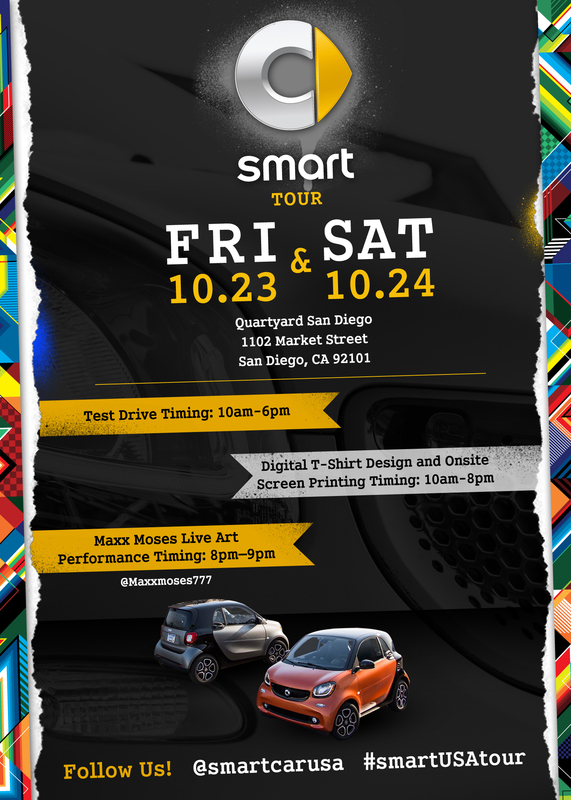 last weekend I had the pleasure of working on the @Smartcartourusa, which stopped in downtown San Diego. Loads of people were on site enjoying the music, craft beer and of course the art work. 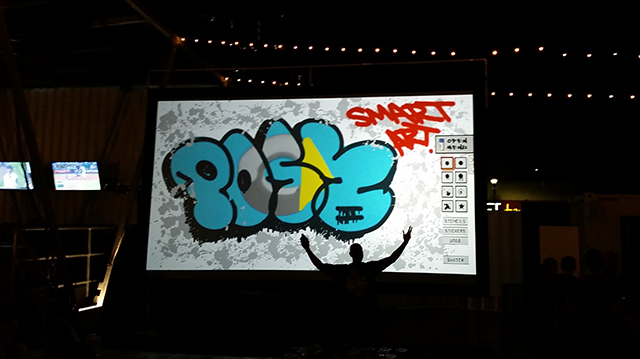 I (maxxmoses) was invited to participate and paint live digitally on an infrared system of light and digital spray paint. 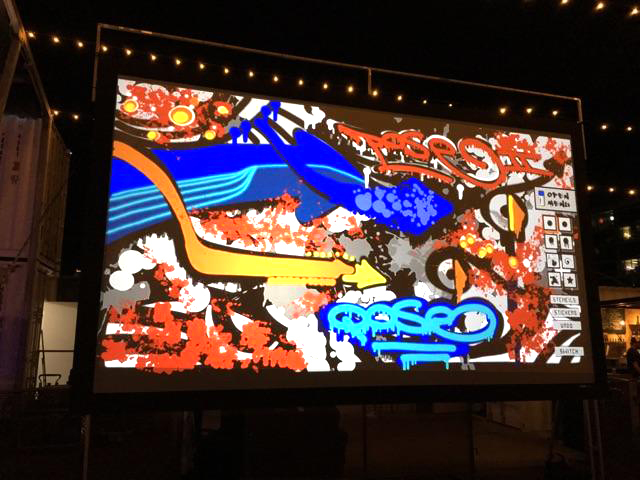 The cool part was that while I was painting onto the screen the art was being projected onto an even larger screen in the middle of the event at . It was cool hearing the crowd response as I was painting. 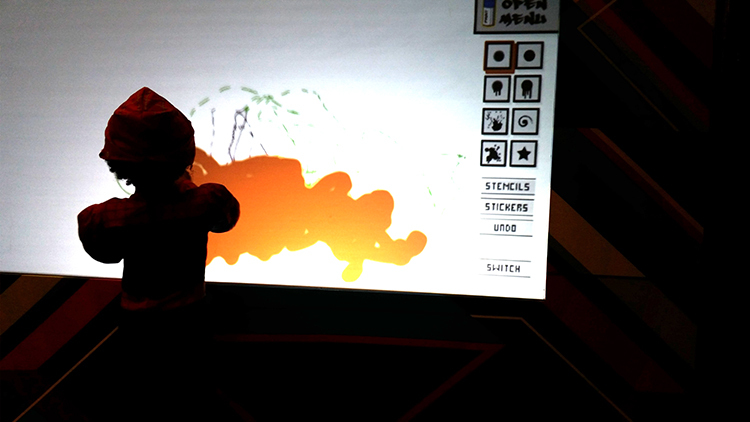 It was truly a blast even my 4 year old son got to paint! I WONDER IF I CAN MAKE A DIFFERENCE! 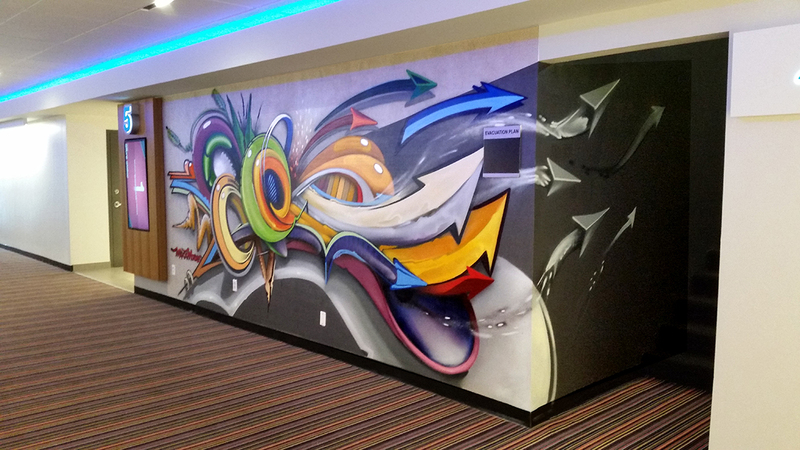 In 2012 with the help of Words Beats & Life I had the opportunity to create 2 murals for the Angelika Film Center in Fairfax Va. On this project I flexed two of my favorite styles, “Alphabet Soup” and “Symetrix” “Alphabet Soup” is all about Graffiti letters randomly distributed with colorful design to bring balance. 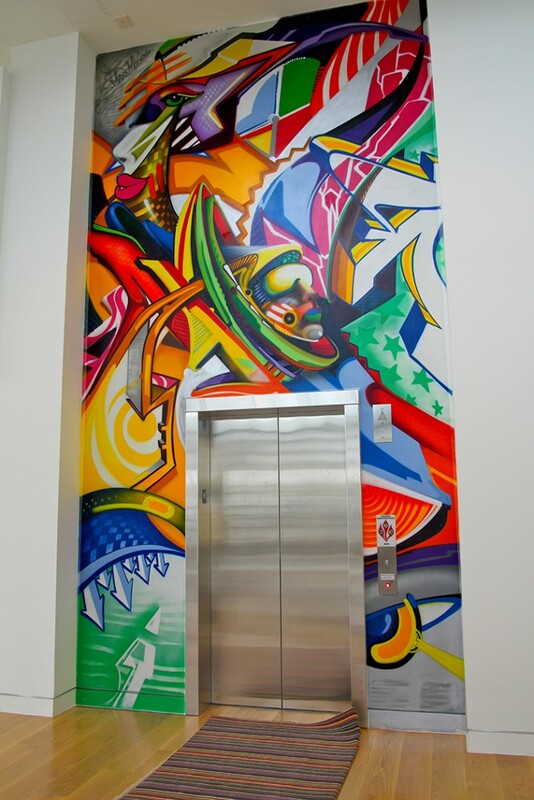 The first mural downstairs around the elevator is where is used this style to say the word Angelika. Using this style the viewer is always intrigued with the challenge of finding all the letters in the word and I have a blast creating new ways to shape and bounce the letters into form. 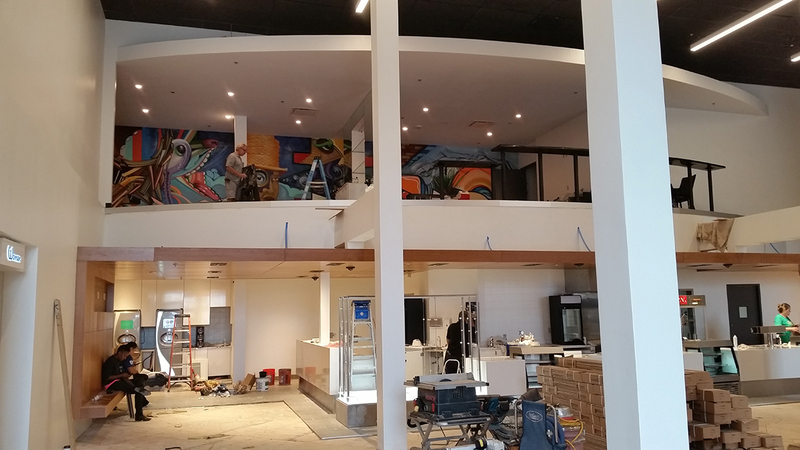 This year Angelika has opened a new theater in Carmel Mountain, San Diego and they asked me to return to paint two murals once again. 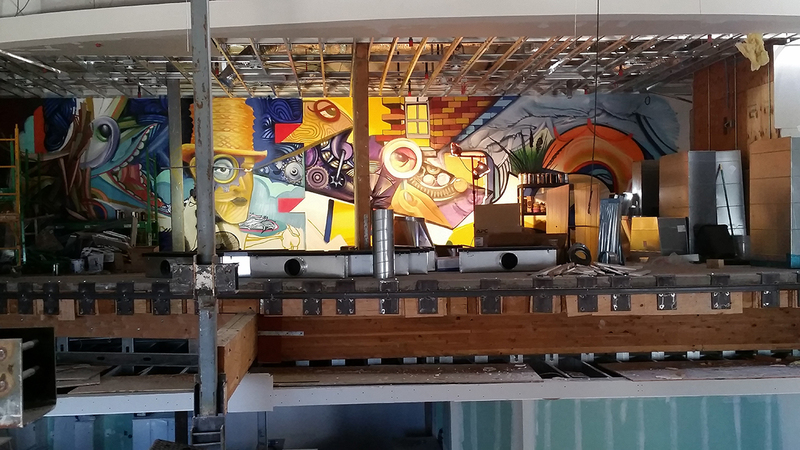 The first wall is upstairs in the lounge area and spans 70ft across 9ft high and is simply titled The Magic Projection. The inspiration for this wall is based upon the idea of movie making, perception, nature and my 4, year old son who while painting at home kept repeating the word Magic over and over again! I thought to myself yes painting is magic and movies are moving paintings. 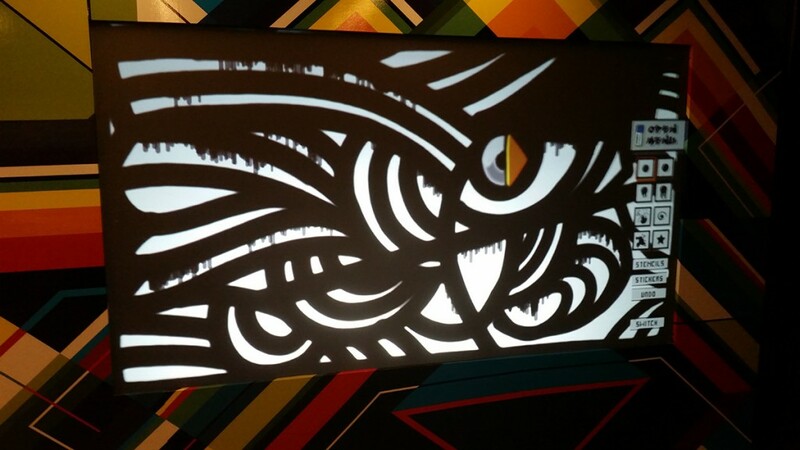 The Magic Projection also incorporates the alphabet soup style, keeping it consistent throughout the theaters. Downstairs, the Angelika staff simply wanted me to create some art that could be used as a guide to lead people upstairs to the lounge. So I used another one of my styles titled “Energenics”. This style is all about dynamic energy, harmonizing colors and movement. 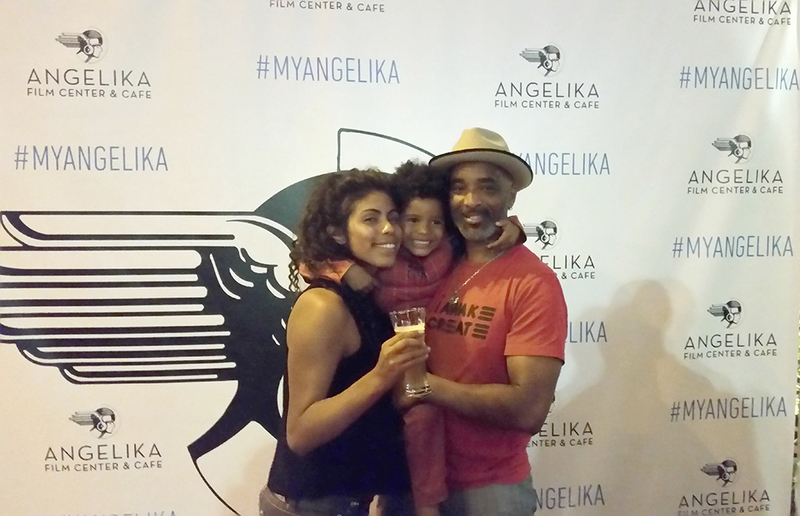 The painting contains 3-D shapes, Graffiti Arrows and is filled with freedom and allowance, all the elements that the Angelika staff promotes and encourages. It’s been so good working with this organization and watching movies lol, you guys are the best. 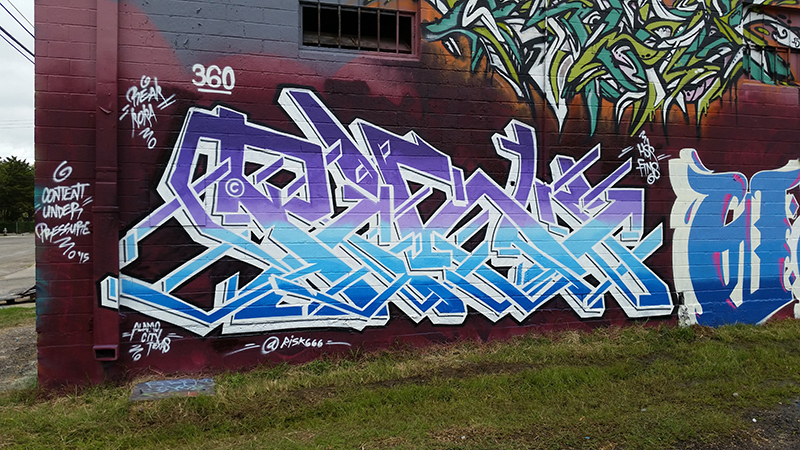 Last weekend my good friend Pilot FX , hosted the Meeting of Styles, in Houston TX. It was a weekend filled with art and artist from all around the country. 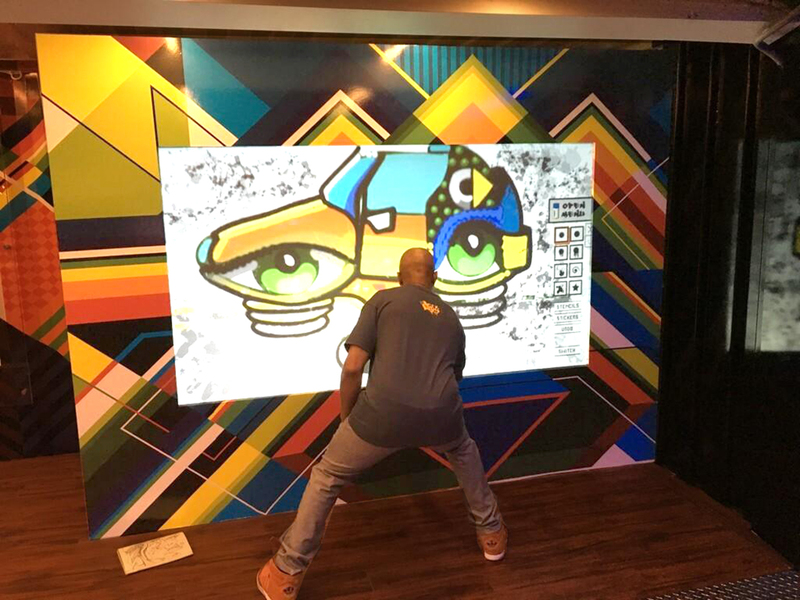 I Personally, think we all had a great time painting and meeting so many new people however the highlight of the event was creating the Mind over Matter mural with the infamous FX Crew. 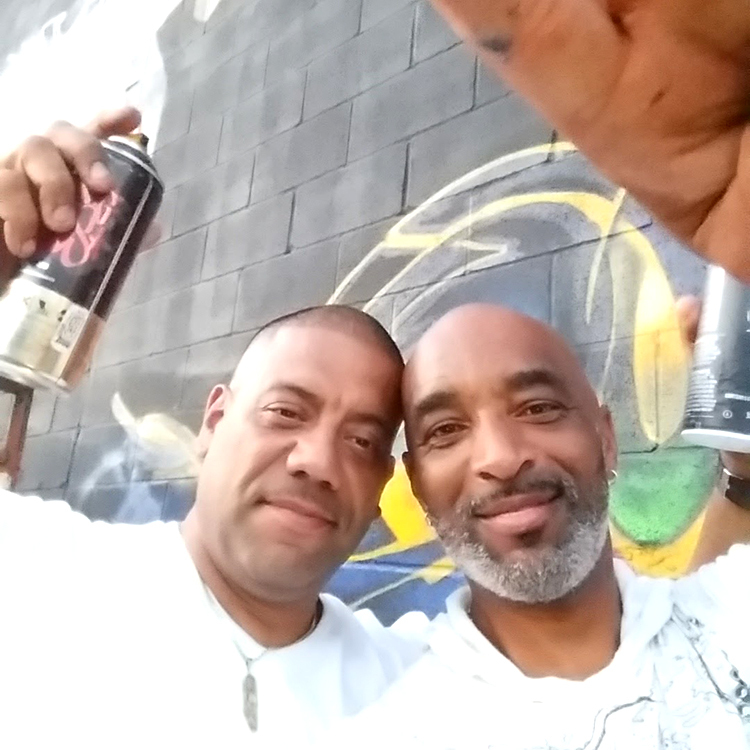 Back in 1992 we formed the FX Crew,(Pose2, Per1, Tkid, Ces, Poem, Nomad, King Bee,Cope2,) in the Bronx, NY. 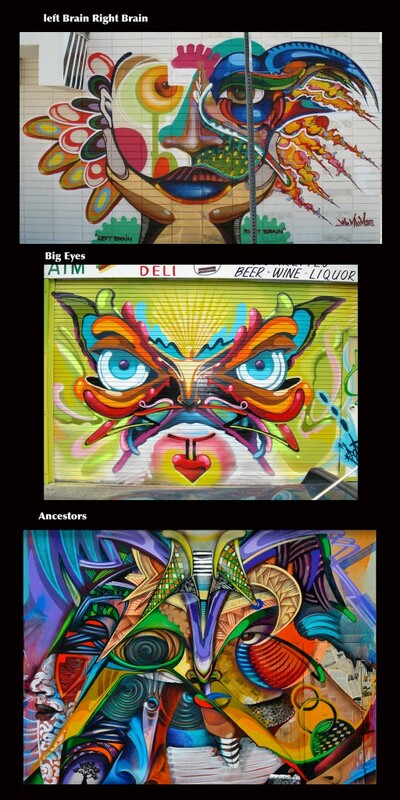 Since its inception this crew of painters has been recognized and respected as one of the most innovative Spray Can Art Crews in the world! 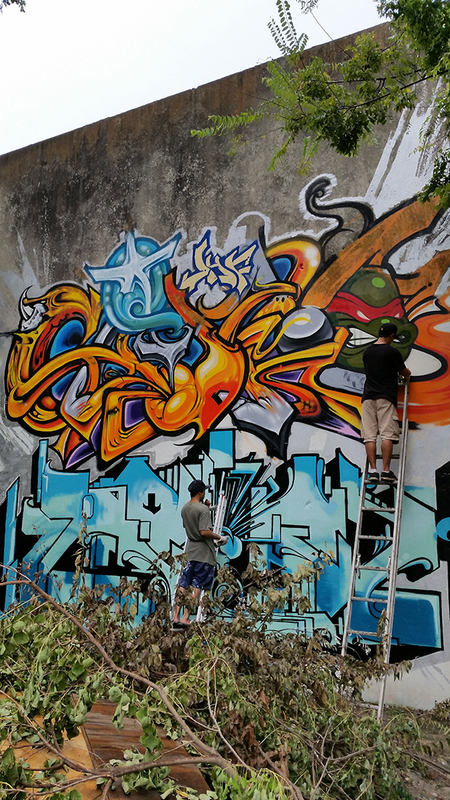 As a collective FX Crew are Graffiti Giants, who paved the way in merging styles and technics from Europe, the United States and Puerto Rico. 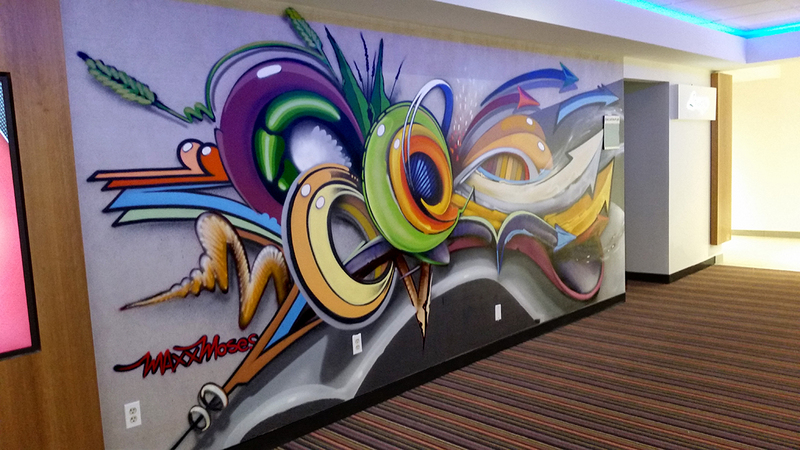 Forging Wildstyle and 3-D lettering with complex beautiful background imagery is the signature style. 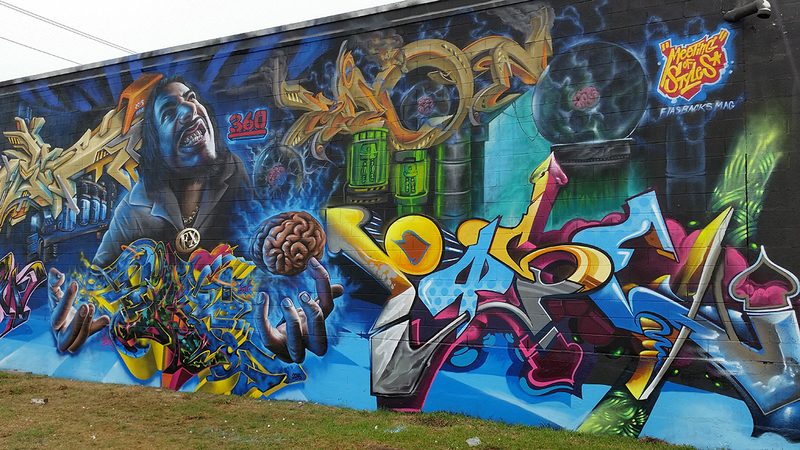 This formula shifted the paradigm within the world of Graffiti forever and set a new plateau for collaborating planning and executing large- scale Wild Style murals. 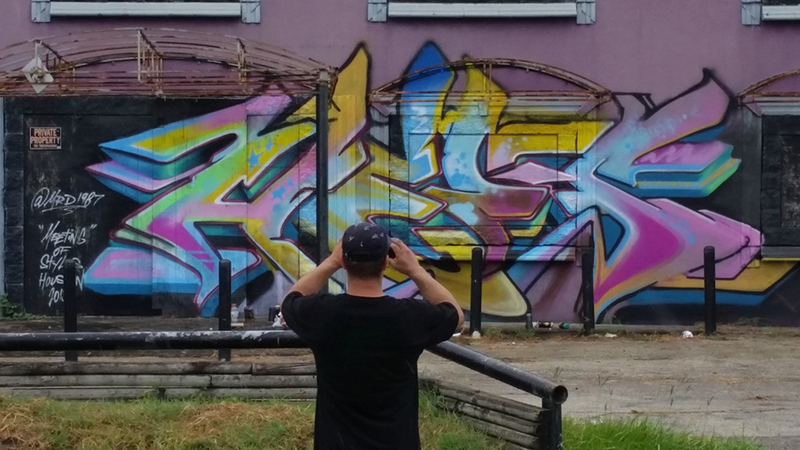 23 years later some old and new members have come to Houston to once again do what we love… “Color The World”. 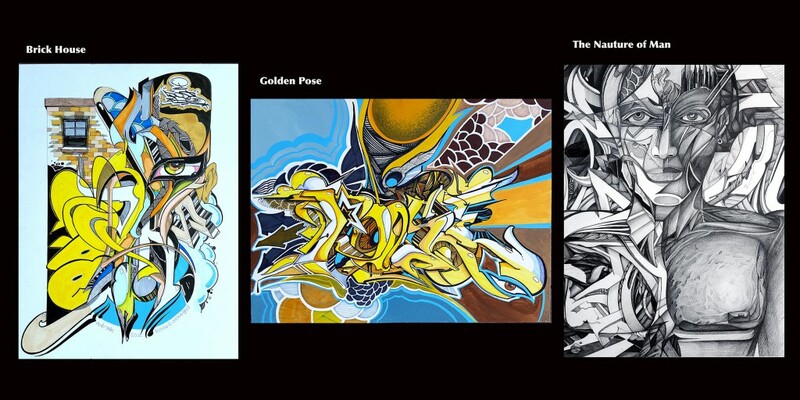 The Wall Series consists of 3 murals painted in Southern California from 2008-2013. While the Pen & Ink Series, are past and recent artworks done on illustration board. These 11×17 prints can be purchased at $25.00 for your choice of three… and can be shipped anywhere in the United States for only $5.00 shipping! 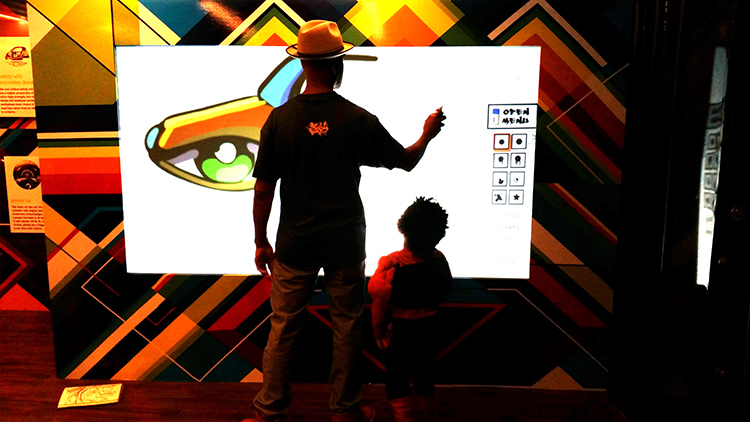 I’ve recently be invited to participate in this project numerous New York based Artist artwork will be displayed in a mobile art gallery which will be featured at various art and food festivals around New York. 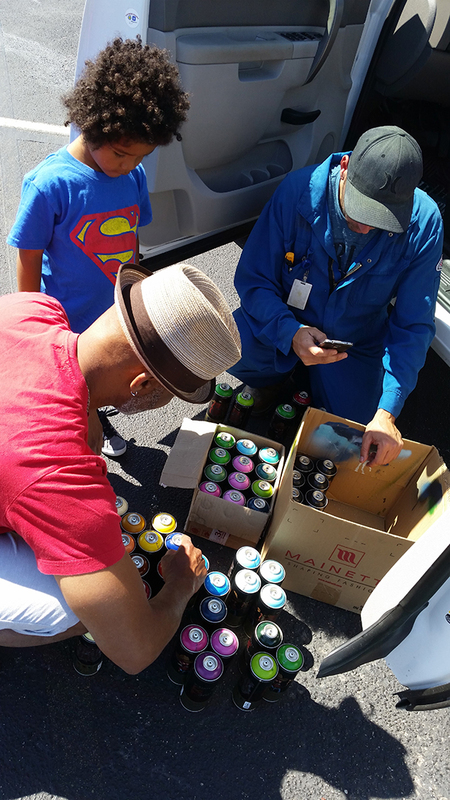 The mobile art gallery will also be used to sample DiLusso products at various deli markets while consumers walk through and view your piece. 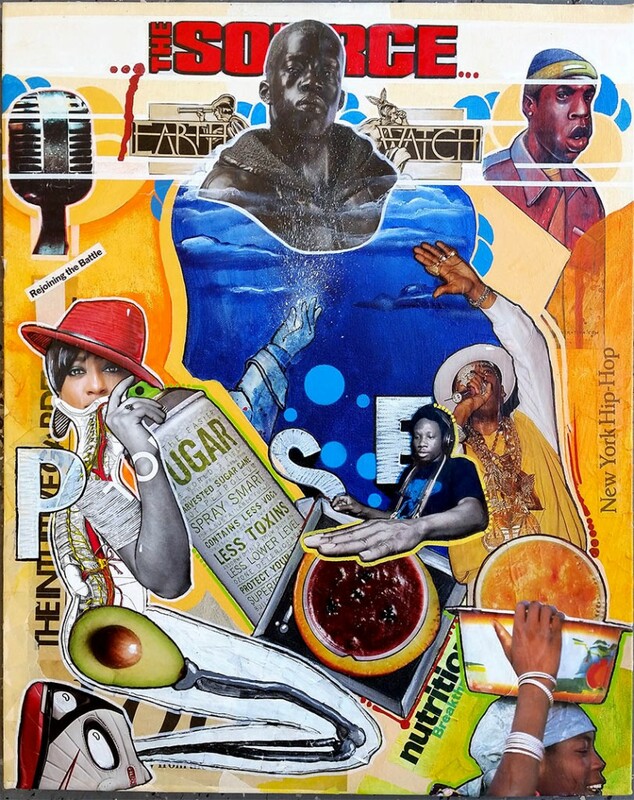 Food For Thought is a mixed media painting infused with collaged images of Hip Hop icons natural foods and of course the flow of Maxx Moses. 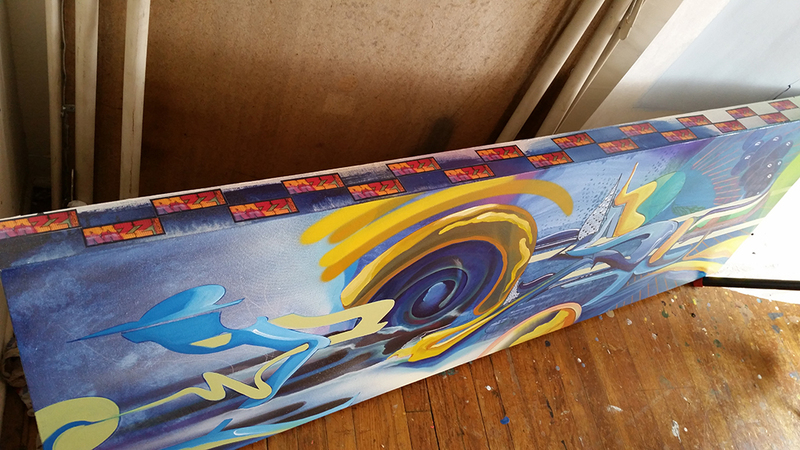 This painting is inspired by the Hip Hop music of 80’s 90’s and early 2000’s. At this period in time the New York Emcee was a verbal chef, cooking up soulful platters of lyrics as “Food for thought”. This Boombastic sound blasting from night clubs, block parties and pimped out rides, nourished our appetites like tasty treats, while the content always kept us hungry for more. More beats more rhymes and of course more style. 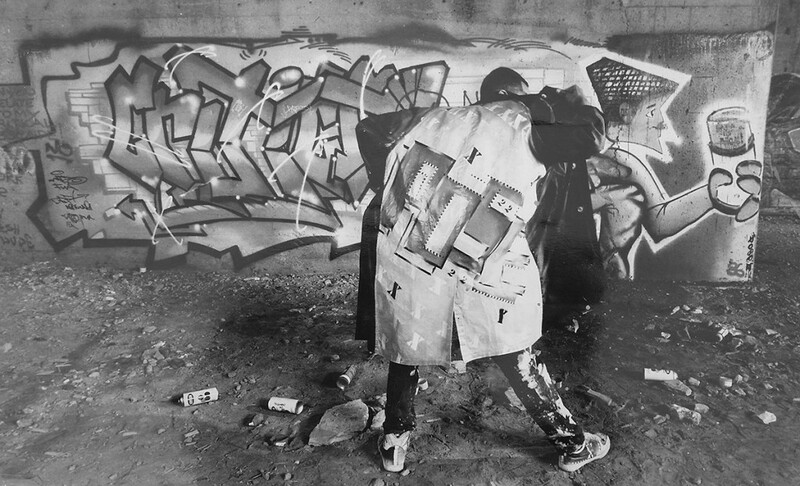 This original style, birthed in New York City influenced Fashion, Art Music and Dance World Wide. For me this is what made New York special.